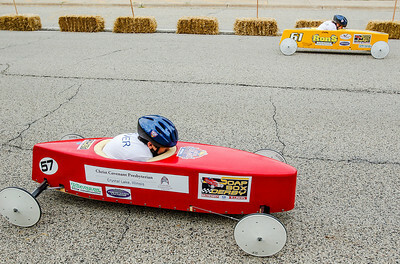 Sarah Nader- snader@shawmedia.com Hannah Denny (left) and Andrew Hoffman race in the McHenry Kiwanis All-American 2013 Soap Box Derby on Waukegan Road in McHenry Saturday, June 21, 2014. 31 boys and girls ages 8-12 competed an the winner of the event received $1,000 to be used toward attending the World Championships in Akron, Ohio. 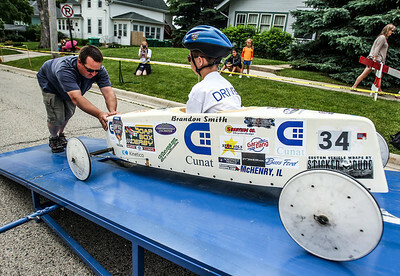 Sarah Nader- snader@shawmedia.com Logan Young, 8, of Algonquin is wheeled onto the platform by his father, Shawn Young, before racing in the McHenry Kiwanis All-American 2013 Soap Box Derby on Waukegan Road in McHenry Saturday, June 21, 2014. 31 boys and girls ages 8-12 competed an the winner of the event received $1,000 to be used toward attending the World Championships in Akron, Ohio. 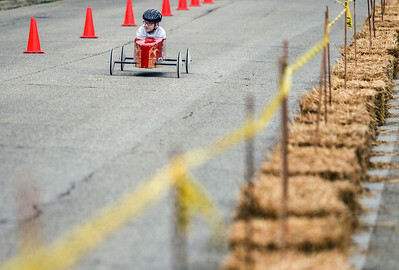 Sarah Nader- snader@shawmedia.com Leander Sullivan (left) and Lindsay Goodrich, 9, of Sugar Grove compete in the McHenry Kiwanis All-American 2013 Soap Box Derby on Waukegan Road in McHenry Saturday, June 21, 2014. 31 boys and girls ages 8-12 competed an the winner of the event received $1,000 to be used toward attending the World Championships in Akron, Ohio. 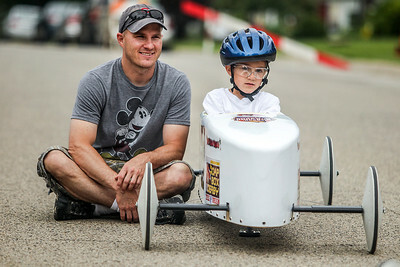 Sarah Nader- snader@shawmedia.com Shawn Young (left) of Algonquin and his son, Logan Young, 8, wait for Logan's turn while competing in the McHenry Kiwanis All-American 2013 Soap Box Derby on Waukegan Road in McHenry Saturday, June 21, 2014. 31 boys and girls ages 8-12 competed an the winner of the event received $1,000 to be used toward attending the World Championships in Akron, Ohio. Sarah Nader- snader@shawmedia.com Racers race down Waukegan Road in McHenry while competing in the McHenry Kiwanis All-American 2013 Soap Box Derby on Waukegan Road in McHenry Saturday, June 21, 2014. 31 boys and girls ages 8-12 competed an the winner of the event received $1,000 to be used toward attending the World Championships in Akron, Ohio. 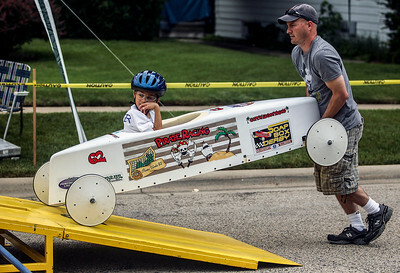 Sarah Nader- snader@shawmedia.com Tod Smith of McHenry wheels his son, Brandon Smith, 9, onto the platform while competing in the McHenry Kiwanis All-American 2013 Soap Box Derby on Waukegan Road in McHenry Saturday, June 21, 2014. 31 boys and girls ages 8-12 competed an the winner of the event received $1,000 to be used toward attending the World Championships in Akron, Ohio. Sarah Nader- snader@shawmedia.com Competitors stand by their cars after racing in the McHenry Kiwanis All-American 2013 Soap Box Derby on Waukegan Road in McHenry Saturday, June 21, 2014. 31 boys and girls ages 8-12 competed an the winner of the event received $1,000 to be used toward attending the World Championships in Akron, Ohio. 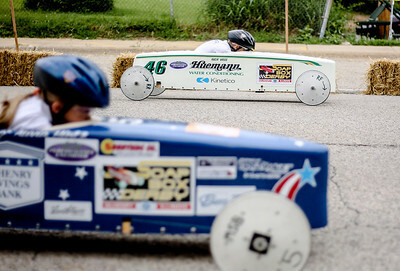 Sarah Nader- snader@shawmedia.com Ethan Rohde races down Waukegan Road in McHenry while competing in the McHenry Kiwanis All-American 2013 Soap Box Derby on Waukegan Road in McHenry Saturday, June 21, 2014. 31 boys and girls ages 8-12 competed an the winner of the event received $1,000 to be used toward attending the World Championships in Akron, Ohio. 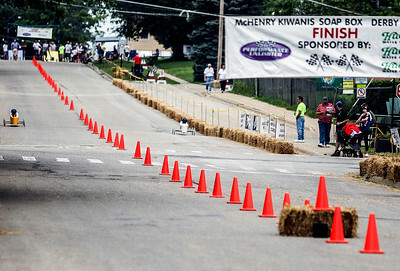 Racers race down Waukegan Road in McHenry while competing in the McHenry Kiwanis All-American 2013 Soap Box Derby on Waukegan Road in McHenry Saturday, June 21, 2014. 31 boys and girls ages 8-12 competed an the winner of the event received $1,000 to be used toward attending the World Championships in Akron, Ohio.